The auto industry is an iconic one. At the beginning of the 20th century, Ford’s technological innovation dramatically changed the world. One century later, car manufacturers are still amongst the biggest companies in the world. Mode of transportation has and always will have a major impact on society and economic growth. Powerful disruptive technology giants have taken on the challenge to spark the next evolution. Google, Apple, Tesla, Uber,.. to name a few. Will the traditional players be able to stay in the game? Let’s compare some fo the biggest car manufacturers based on multiple metrics. In terms of market capitalization Toyota has a strong lead. The top 3 of each metric is marked by being green. A quick explanation of the indicators: P/E is the widely known price to earnings ratio, used to determine whether a stock is overpriced relative to its competitors. EPS are earnings per share, used to determine the pay-out-ratio, which is the percentage of net profits being returned to shareholders in dividends. Dividend Yield/Pay-out gives a multiple to compare the dividend yields relative to the observed pay-out ratios. Having a low pay-out ratio can indicate that further dividend increases are to be expected, but it also means profits are being put to work by the company, rather than sharing it with shareholders already. Dividends (2014) are the sum off all dividend payments in calendar year 2014, and Dividend Yield is calculated using the stock price at the last dividend payment of 2014. Unsurprisingly, no company takes top-spots in each category. While Volkswagen has a relatively low P/E, meaning the stock looks rather cheap, it had the lowest dividend yield in 2014. Even combined with the lowest pay-out ratio, it doesn’t result into an encouraging Div Yield/Pay-out multiple. Daimler manages to provide an attractive dividend yield of 3,45%, having a relatively low P/E of 9,6. It does, however, require 38% of its profits to maintain this. Management has promised to pay-out 40% of net profits in the future, regardless of the size of the profits itself. At least the company is being clear about it. Ford looks like a less attractive investment because of having both a high P/E value and a high pay-out ratio. This means fewer profits are being invested into new technology. They will surely not be able to maintain this pay-out ratio and effectively have to lower the dividends if profits do not rise. There are many ways to interpret certain metrics. Tesla doesn’t even turn a profit yet, but investors are pouring millions into the company. While it makes perfect sense to use these tools when making an investment decision, questioning the entire sector is equally important. Constant technological improvements are thrusting forward our transportation systems worldwide. More fuel-efficient cars, improved aircrafts, advanced railroads and other innovations are encouraging further economic growth. Most of these improvements haven’t structurally disrupted the system: we still use cars, trains, boats and aircrafts to transport goods and persons. Until now. Existing technology could disrupt the entire market, market leaders should pay close attention. Obviously being one of the most talked-about topics within the auto industry, the electric car is starting te become a reality. Although its arrival will make or break certain car manufacturers, the innovation in itself only enhances the concept of a car. Energy for the vehicle will be cheaper and more environmentally sustainable, but other aspects stay the same. More on this in the paragraph new competitors down below. Self-driving cars have far more disruptive power than electric cars. There would be no need for a driver. People could perform tasks or even take a nap. The entire experience changes. But in a way the concepts are intertwined. New players within the market will surely opt for electric cars. Why would firms chose old technology over enhanced technology, especially because these firms already have a lot of knowledge regarding batteries and close to none regarding the combustion engine. The creation of a self-driving car will only stimulate the creation of more electric vehicles. A more in-depth analysis follows in the paragraph, new competitors. Drones are a big innovation in many respects. Quick development of this technology is supported because of its potential use within the military complex. Commercially, Amazon has started a program called Amazon Prime Air which would deliver goods with small drones within 30 minutes. For American consumers, it would cost around $1 to let a drone deliver your package in less than half an hour. Imagine every product purchased online being delivered by a drone. If the cost is minimal, why wouldn’t consumers consider this? Once people get used to it, groceries and other small consumer goods could be delivered using aerial transportation. A major hurdle in this regard is regulation which is not yet on point. The Hyperloop idea, another one of Elon Musk’s adventures, is starting to become a reality as well. With Boeing, Nasa and SpaceX being involved, it’s hard to see the project halt anytime soon. This innovation could easily be the most disruptive one. Similarly to the railroad network, the Hyperloop network wouldn’t hold the same degree of freedom that cars can offer, but its quality could induce a major shift of behavior. Hyperloop CEO Dirk Ahlborn discusses the issue in an interview with Bloomberg. To be fair, many firms are working on new projects. All biggest car manufacturers produce at least one hybrid or electric car ranging from cheap models to luxurious sedans. The arrival of a new big producer looks inevitable and it’s not at all clear whether the market can absorb another one. Big technology giants are starting to enter the scene. Enjoy this quick summary of each project and its development. The Apple team has been working on their electric car Project Titan for years. Apple’s ambition is to produce the first car in 2019. Having attracted several engineers from Tesla and Ford, the company is starting to ramp up efforts. At the beginning of 2015 rumors were spread that Apple was interested in using the BMW i3 as a starting base. All rumors were denied, but Tim Cook did visit the BMW i3 building site and parties are constantly talking about future relationships. In August, the Guardian obtained documents which helped fuel speculation that Apple is indeed building its own vehicle. Perhaps named the iCar? Apple engineer Frank Fearon contacted GoMomentum Station, the largest secure test facility in the world. Having signed a non-disclosure contract with Apple, the company only confirmed talks had taken place. 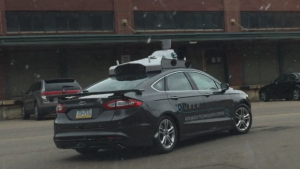 Taxi-service company Uber has also started developing its own driverless car. At this point it seems Uber uses a Ford vehicle to test its software. These are the first steps of a long process, but where does it lead to? Uber CEO Travis Kalanick has already stated if Tesla is able to produce 500.000 driverless cars in 2020, which Elon Musk has stated, he would buy every single one of them. In addition, in 2013, Google invested 250 million dollars in Uber. So what’s the deal? Is Uber really planning on taking on all these rivals with its own car? Or is the company merely trying to improve its attractiveness for a possible take-over. Future will tell. Although being one of the youngest car companies in the world, Tesla has already produced two electric cars, with two more in the pipeline. After the success of the Tesla Roadster, the company developed the Model S, which is starting to become an even bigger success. The Model S recently scored 100 out of 100 at a Consumer Reports rating. In June 2015, the car was sold 75 000 times. Tesla is clearly in front of competitors when it comes to electric cars. The mileage is superior and a loyal fanbase has been built. The next step in the process of bringing electric cars to the public is the construction of Model 3. 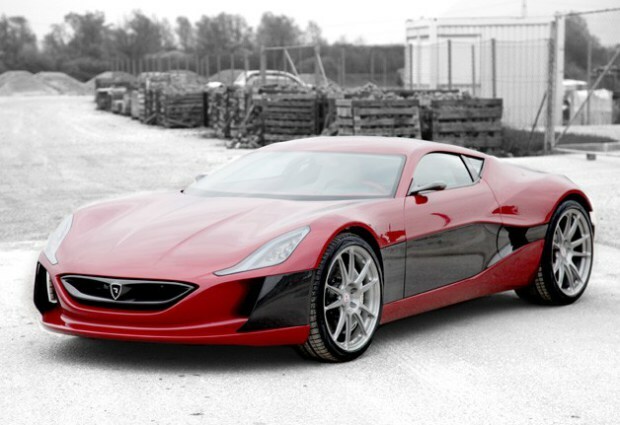 This would become an affordable electric car starting at a $35.000 price tag. In the meantime, the first shipments of the Model X should be hitting the road soon. Tesla developed this luxurious SUV to show the world it can handle any type of car (and to make some money, obviously). Elon Musk has recently stated driverless cars will be available in 2020 and Tesla itself is working on an ‘autopilot’ version. is The next consolidation wave in the auto industry around the corner? Looking back at history, it seems plausible that some big car companies will fail to make the transition to modern transportation. Not everyone will be able to adapt fast enough. Companies will either go bankrupt or will be bought by rivals. Once this happens, you better have betted on the right horse. In 2009, the US government saved two major manufacturers: General Motors and Chrysler, resulting in a bail-out of 80 billion dollars. If forced Chrysler to merge with the Italian manufacturer Fiat. European car producers were suffering from declining sales and revenue, lower stock prices, and financial pressures. Merkel announced the Auto Industry Financial Support Package in 2009, worth almost 2 billion US dollars. A prime example of the vulnerability of traditional car manufacturers is Volkswagen. After being caught cheating test results for CO2 emissions in the United States, it admitted having installed software in 11 million cars worldwide. The company has made a 6,5 billion dollar provision for fines and claims. The stock has plummeted from €160 to €110 in two days. Whose side would you rather be on? Let’s assume the massive disruption will happen in 2020, as many companies are aiming to have a self-driving car out in the market. Traditional companies such as the ones listed at the beginning of this post are trying to adapt to the new developments in the auto industry. Most of them already produce electric cars and hybrids, but none has really been able to control the market. Even so, it is useful to compare disruptors with traditional players. Which company would you rather own? Being a possible disruptor (Apple, Google, Tesla, Uber,..) has both advantages and disadvantages. First of all if we compare market capitalization, some big technology firms look very robust. Apple has a market cap of 660 billion dollars. Google follows with 430 billion. They look ‘too big too fail’ if anything were to happen to the overall car industry. In a market downturn, rather than being targets, these firms could go hunting for other companies. A second advantage is having a diversified income stream. During price wars, Apple and Google could depend on other activities to provide liquidity. Many of these new tech giants have been able to attract very talented people. Engineers at Tesla are oriented towards changing the world and are completely indulged by the new technology. Many of them are extremely motivated to succeed. It takes courage to enter a new market: lot’s of things change. Firstly, Apple is used to have 35% profit margins on its products. Is this probable for cars? Traditionally, the margin is about 10%. Secondly, they will need to either adapt to the market structure, or change the way consumers buy cars. Either way, it will be a challenge. Traditional car manufacturers have been around for decades, making brand recognition an important asset. The turbulence at Volkswagen shows how fragile a brand can be. In a way these companies are increasingly getting more vulnerable because of a change in public opinion. Being around for so many years made many of these companies rigid and slow to adapt. But as a plus, it has provided them with lots of dealerships, contracts and long-lasting business relationships. Big car companies have often been able to influence politics, which is, considering the circumstances, not surprising. First of all, many governments are proud of their car manufacturers, it’s a way of showing the strength of your economy. Secondly, car plants provide many jobs, which are used to put pressure on the government. In a period of panic and low valuations, which will unquestionably follow sooner or later, anything is possible. With Apple sitting on 300 billion dollars, it could easily try to buy enormous stakes of traditional car companies. Especially Uber looks like a company that could be swallowed by competitors. Volkswagen was able to position Audi next to BMW and Mercedez-Benz as an alternative luxurious brand. With the recent turmoil, positions may change and consolidation could easily follow. 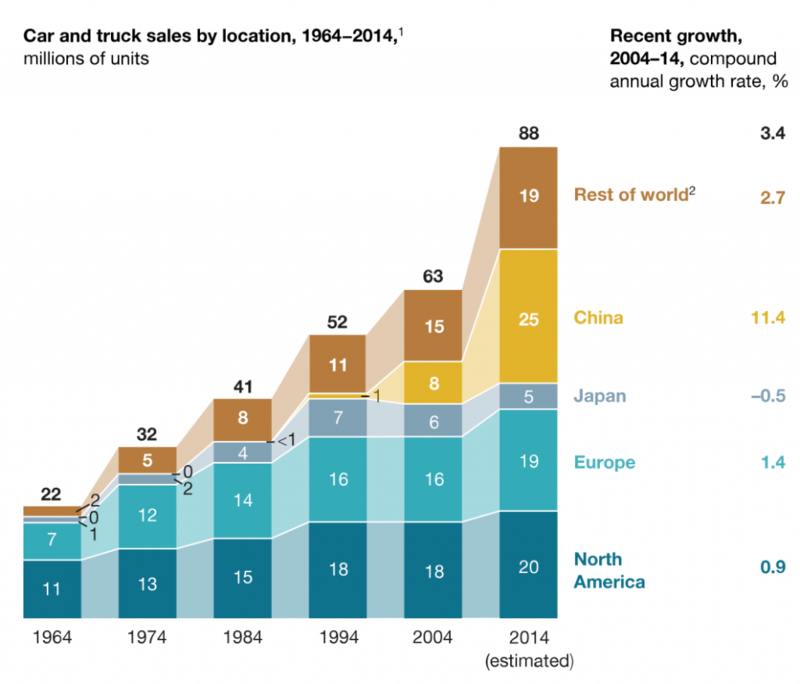 For the past two decades, consumer demand for cars has increased with 3% each year. Opportunities are shifting towards East-Asia and other emerging economies. In less developed economies, infrastructure and price should be large barriers for consumers to buy electric or self-driving cars. Population growth for the world as a whole is still huge. It’s estimated that by 2025 there will be 8 billion people on earth. If the pie keeps growing, every manufacturer will be able to stay in the game. Perhaps traditional companies with promising activity in emerging markets will be able to outperform traditional competitors. On a longer term, prospects can be rather dim. Imagine the Hyperloop becoming a reality. Surely people will change their behavior if they can travel three times as fast as today. Imagine drones delivering goods to your house, why would you need a car? Behavioral changes in the labor market, together with technological improvements, are stimulating working at home. Why would you need a car? Many young people have strong ideas about the environment and would think twice before buying a car. Sentiment really has changed, the Volkswagen example being a prime example yet again. Will the car remain the status symbol it is today in many societies? Further urbanization should also start limiting the demand for cars and simultaneously increase demand for more advanced transportation. There are different ways to survive technological changes. Some producers might focus on emerging economies because of higher barriers for advanced cars. Others try to keep up with competition by developing their own electric vehicles. It boils down to this: whoever wins the race of making the best electric car, will flourish in the short term. Tesla seems to be taking the lead in this respect, but others are already pushing the next innovation: self-driving cars. If traditional car manufacturers don’t quickly change gear, they might end up being blown away by new market entrants. What do you think? Will the arrival of electric and self-driving cars lead to a massive wave of new consolidation within the sector, or will traditional players be fast enough to adapt and preserve their market share?